I felt like it was just too red and brown in the middle (block one) - and since I've been using blue and grey fabrics in it recently, they should be in the centre too. In my defence, when I put block one together, I hadn't finished purchasing all my fabrics yet. I considered taking the paper pieced middle apart and replacing the brown diamonds with blue ones, but quickly dismissed that as too much hard work. Instead, I replaced four red squares with fussy cut blue ones, and I'm really happy with the result. I'd like to say that I won't do any more unpicking and replacing, but I'm not sure it's wise to make such a sweeping statement! In other news, today after school, I took the kids to the plaza, we were on a mission to make appointments and purchase bits and pieces for Amy's formal (prom) which is coming up in the middle of the year. I'm happy to say that we got pretty much everything done ... and while shoe shopping for her, found these cuties which HAD to come home with ME! Aren't they darling? I love them!! True to my word (and my Quilters ADD) I've completed a few more Farmers Wife blocks. 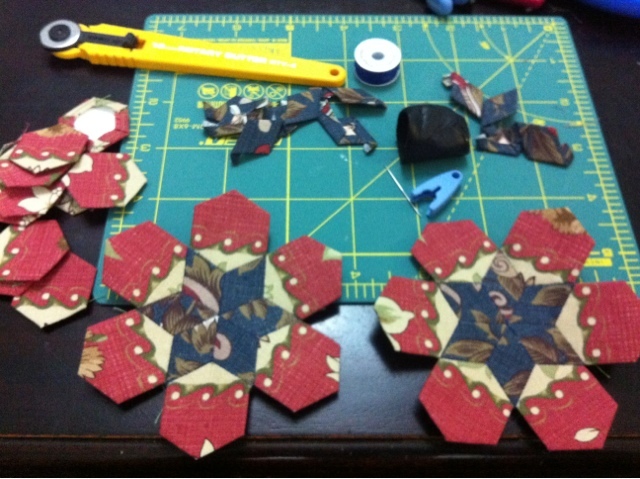 All fun ones to make - the first three foundation pieced. They're so nice to make, but I have to pay careful attention to my seam allowance. It's very easy to make them too narrow. So far so good! I think I'll do some Farmer's Wifeing this afternoon - I believe I have quilter's ADD! I'm so excited to be working on a new block exchange with some of my bestest friends, Linda and Donna :-) We're making Rail Fence blocks with a little interest in the middle there. My Farmers Wife Sampler book has been calling to me, so over the weekend and this morning, I answered the call. Thank goodness, because I've really missed these darling little blocks! Today I finally did something I've been wanting to do for AGES! I have had a Thimbleberries quilt on the wall in my family room for such a long time, and it had gotten to the point where I was beyond sick of seeing it, I was beginning to strongly dislike the quilt. The hanging sleeve wasn't really put on properly so it had become saggy, and I don't really think it was big enough for the wall. Though you can't really see in the picture below, on the left side of the TV, there are some ugly cables hanging out of the antenna socket. How nice it would be to have them covered up. So, today was the day. My 'Turning Four-T' quilt was the one I really wanted to put up, and it needed a hanging sleeve. Done. Next I took the offending quilt down - and had to move the hooks and find a larger dowel. Done and done :-) And ewww, the old quilt needed a wash, badly! Also done! So, now you see one of my favourite quilts hanging in the family room. Offending cables and antenna socket covered, and I'm so pleased to have something different to look at. And now that I think about it, even the colours are more appealing. Today I finished the binding on my nephew's quilt. 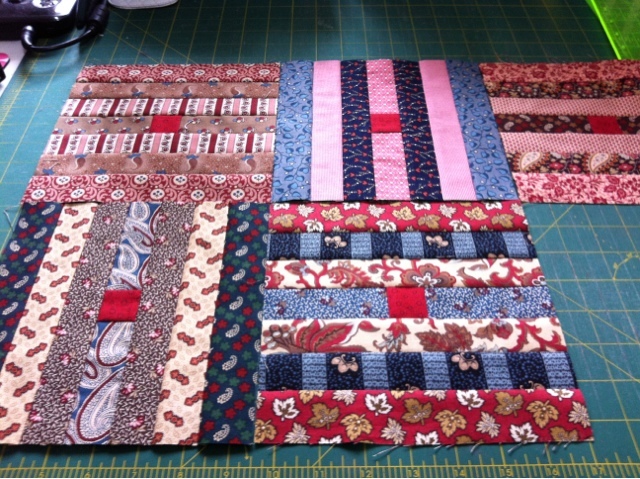 These Jelly Roll Race quilts are certainly speedy projects. I chose a simple free motion pattern for the quilting, used a bright variegated thread, and it looks quite cute don't you think? The coordinating fabric isn't from the same range as the jelly roll, but it goes quite well. I purchased a metre (which is about a yard and three inches). It's used for the squares, the binding, and I had a small chunk left to piece into the back. The backing fabric with the spots was already in my stash - I think I got it on a super bargain at Spotlight. I think around $4.00 a metre or so - almost used that up entirely as well. Happy days! On Wednesday I was going through my pantry, and found a baggie of bread flour that I'd forgotten. So many bloggers have chattered about making bread - and it has been a little while for me, so I got busy. I used Judy Laquidara's recipe, but I know I made a bit of a boo boo with the flour - I put a little too much in and the dough was a little dry. Here's the bread getting ready to rise in the dining room - it's often warmest there in the middle of the day. And here are the finished loaves - the kids just love fresh bread. There really is nothing like it. and it didn't last long! And given that I'm chattering about food and pantry stuff ... a blog that I read semi-regularly is the Frugal Girl. She has inspired me to think more about how much food we waste in this house - and how many things I purchase on impulse when I'm at the grocery store. I know, I know ... how could anyone possibly guess what I was going to do with a jelly roll and a little fabric? There are so many possibilities :-) This is the first time I've used a jelly roll, and I decided to do what EVERYONE seems to be doing right now - a '1600 Quilt' - or a 'Jelly Roll Race Quilt'. It took me some time to separate the fabrics into the order I wanted to sew them, and then to add the little squares between the strips. But after a while and some pressing, I was ready to go! This is part of the mound of fabric I was faced with after stitching the first two strip lengths together. Not very interesting right now huh? Apparently, the fastest time for someone to sew the Jelly Roll Race is 35mins. I can't even imagine that! It took me an hour to sew the first long seam, and three hours total. But I did take some time out to help Amy bake some cupcakes. Whoever that person was, they must really have had the pedal to the metal! And this is what my quilt looks like prior to pressing. It's hard not to get fabrics and patterns sitting next to each other, but with this technique, it's all part of the charm of the quilt. Usually for these quilts, the strips are simply sewn together with a diagonal seam. But when I purchased my jelly roll from Widebacks at the AQC, the kind lady showed me two quilts she'd made using 2.5" squares between the strips. They looked wonderful, so I decided that's the path I'd take. The binding will be from the same fabric as the squares, and I've used the remaining piece as part of the backing fabric. I really have very little fabric left over! I've pressed the top now, and I'm hoping to get it pinned today ready for quilting. Chores have gotten in the way so far, but later this afternoon is looking good :-) This quilt is destined to be a gift for my new nephew - he was born on the Easter long weekend. So exciting! If you're interested in the Jelly Roll Race quilts, I hear there are some wonderful tutorials on You-Tube, so be sure to check them out. The stripe fabric will be put into use this afternoon, the argyle fabric goes with an upcoming project for Camo. The conversationals are just because ... I always collect them when I see them. And the Michele Hill pattern is for some gifts I'd like to work on later in the year ... always thinking ahead *lol*. The AQC is held at the Royal Exhibition Centre in the Carlton Gardens. It's the most delightful building in beautiful surroundings, just on the edge of the city centre. We were able to walk there from our hotel which was on Little Bourke Street. I was fascinated by the beautifully painted Victorian interior, and took as many pictures of the painted surfaces in the building as I did of the quilts themselves. And this is one of the things we were here to see - my quilt hanging in the 'Best of the Best' special exhibit. It was such an honour to be selected as one of those to represent South Australia with the other quilts from around Australia. I would love to share lots of pictures of other quilts hanging in the show - but on the program there are explicit photography rules, and copyright is such a touchy subject lately. However, dash on over to the AQC website, and there are some lovely pictures of the 'Best of Australia' quilts there. There were so many opportunities to shop and shop some more. I purchased a jelly roll to make a quilt for my new baby nephew - some templates from the Scissorman, and a new pattern from Somerset Patchwork and Quilting. We had a great day out - bumped into many friends, and I really hope I'll be able to visit again next year! I'm super happy with the fussy cutting of the red/border fabric - both the print in the little sashing strips, and the one in the hexies. Yay! And now I begin cutting the *hundreds* of pieces for the next border. Yes, you read that correctly ... there are HUNDREDS! I have a feeling I'll be jumping back over to the Farmers Wife quilt for a little light relief ... and to feel like I'm actually getting somewhere! I'm now half way done with the corner hexagon shapes for 'block 3'. Mrs Billings Coverlet is soooo addictive! Here's the result of my weekend's hexagon piecing - I've added the 'block 3' border to my Mrs Billings project, and I'm just thrilled with the result! I'd also like to get back to making some more Farmers Wife Sampler blocks today - do you ever wish for more hours in a day? I often do :-) With parent/teacher interviews tonight, a basketball training meeting after school, and other everyday stuff, I can't see too much being done in spare minutes. Definitely not challenging blocks, but so much fun to see the block count slowly growing.